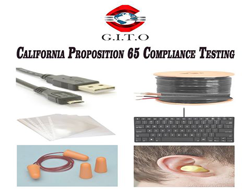 G.I.T.O offers comprehensive testing and quality assurance programs to ensure your product’s compliance with California Prop 65 requirements. It is The Safe Drinking Water and Toxic Enforcement Act of 1986.The State published a list of naturally occurring and synthetic chemicals that are known to cause cancer, birth defects. California Proposition 65 does not prohibit the sale of products containing its listed chemicals, but it does require the manufacturer to provide a "clear and reasonable" warning if a product’s content of a listed chemical exceeds the "safe harbor level. California Prop 65 applies to all consumer products, toys and children’s products, Cosmetics and beauty products, Electrical and electronic goods, and Furniture. Manufacturers, importers, distributors and retailers of consumer goods must ensure that their products comply with the California Proposition 65, to protect their companies’ reputation and to prevent any bad impact on their brands. G.I.T.O offers comprehensive testing inspection programs to prevent your company’s recall risk. Save money and avoid costly defects by ensuring your product imports meet your specifications and quality standards both during the laboratory testing process and also during production.